It is no secret that being an educator is an incredibly complex profession. It is also a rewarding profession. Yet to someone who does not teach, that has only the perspective of being a student or a parent, the profession can seem simple at best and “less than” or hopeless at worst. You take children, talk to them about a subject, give them an activity, and they should produce results, right? The reality could not be further from this analogy. In Michigan’s polarized political climate, it can be hard for teachers to talk about what they do both in the classroom and outside of it, and demoralizing when others speak on behalf of this profession we so deeply love. We know that teachers have a feeling of pride when they look at their students and their work, but this pride should not just be a feeling–it should translate into a call to action . We need to share what we do and the results we produce; not just the raw numbers of test scores, but the intangibles of culture, climate, and community. We need to share how we can make this profession even better. In the spirit of starting off the new year, 2017, here is what makes me proud to be an educator in this state. When I first moved back to Michigan after teaching in Chicago Public Schools for six years, I missed the tight-knit bond of Chicago educators I had at the teacher-powered school I came from along with the teacher leadership opportunities I was a part of. Even though I had immediate family members who were also educators, I needed to find networks of educators to grow with and wrestle with the particular challenges I was facing along with hearing from outside perspectives. It was then that I discovered the power of digital professional learning networks (PLNs). In Michigan alone there are robust online communities on Twitter, Google+, Facebook, Voxer where hundreds of educators talk about policy and practice. I have fostered deep connections with my PLN from the #miched Twitter group, the MI Ed Voice Fellows, and the MI NBCTs that have turned into professional learning and growth opportunities. When I needed a mentor to help me guide my school through assessment and feedback, I reached out to my digital PLN for help. When a teacher across the state asked for help on assessment, I could share resources and ideas and direct them right to the thought leaders from my Michigan PLN. I am proud to be a member of such powerful PLNs. I work for a truly unique public school partnership in the state of Michigan, called the Washtenaw Educational Options Consortium (WEOC). Through the work of all the public school superintendents in the county, we jointly offer educational options to high school students that need an alternative to traditional high school school structures including a blended school model for high-risk, high-needs students, an international baccalaureate program, and an early college program. This innovation is something that is not unique to Michigan or my county, but the level of cooperation among public schools seems to be. Instead of fighting over students, we banded together to offer these options across the county and the data shows the success of our work. Our schools are built with teacher leadership opportunities that are exciting to take on and new directions to explore with our students. Our truly talented teachers trade fancy new gadgets and gizmos for more autonomy, flexibility, and voice in our schools. These efforts retain quality personnel in key roles. I am proud every day to work for WEOC in Washtenaw County. One of the reasons cited for teacher turnover continues to be the lack of teacher voice from classroom decisions all the way up to national policy. With the Every Student Succeeds Act, we have a real opportunity in 2017 to engage Michigan educators, parents, students, and policymakers in dialogue around continued voices in policies that affect us. I have had the opportunity to work with policymakers and found that all they need is an invitation to visit with our school and students. Our area representatives have not only visited, but I have developed real professional relationships with them. But the vision for attracting teachers to Michigan and real opportunities for student growth here will collapse without teachers providing input on a clear vision for education and opportunities for teachers and students to grow and advance. I continue to advocate for educators to have autonomy, flexibility, and trusted to make student-centered decisions. If we don’t speak up for ourselves, someone will do it for us. I am proud to support the inclusion of teacher voice in education policy at the state and federal levels. There are many more reasons why I am emphatically a proud Michigan Educator. Through the support of my PLN, the innovations of public school districts, and the opportunities for teacher voice, I feel a true sense of community. My call to action is for educators to expand beyond our educator community and share how and why our profession should be inspiring awe. I invite all parents, community leaders, and policymakers to come and not just visit, but shadow myself and other educators to see why. Sarah Giddings is a National Board Certified teacher in social studies and history. She is currently an advisor, multi-subject instructor in Big History, social studies, and ELA, and curriculum coordinator for the WAVE Program with the Washtenaw Educational Options Consortium high school programs in Ypsilanti, MI. She is a National Hope Street Group fellow, a Teacher Champion with the Collaborative for Student Success, and a Teacher-Powered Ambassador with the Center for Teaching Quality. She is also a post-residential America Achieves MI Fellow. Sarah has a B.A. from James Madison College at Michigan State University in Social Relations with a minor in English. She has a Master’s in K-12 Education Administration and a professional certificate in Educational Technology, also from Michigan State University. I have the pleasure this year of serving as a National Teacher Fellow for the Hope Street Group. Hope Street Group is a nonpartisan edpolicy organization. I’m the first fellow from MI, so you will be hearing much about my experience on the blog this year. One of the suggestions they had for us at a national convening last week was the idea of creating a digital media strategy. I decided to make mine an “edmorningmessage”. I posed a question on Twitter, solicited responses, and at the end of the week (my attempt obviously lasted into next week) I hope to write a blog about it. Also at this convening, the debate arose of what we should label ourselves – teachers or educators? Are these merely synonyms? Nuances of language? Posing this question on Twitter, I saw more of those in the profession embracing the label of “educator”, while others in traditional schools and roles preferred the term “teacher”. One person asked, “How you would define one over the other?” Another shared that their “business is education” so they would say “educator” because they are not always in front of students. Many of those participating in the Twitter conversation mentioned that they felt teacher did not incorporate the ways in which they were involved in the education community and that educator better encompassed all of these terms. However, most were also careful to point out that one word isn’t necessarily better than another? I used to refer to myself as a teacher. Teaching defined my day-to-day interactions with my students and traditional modes of delivering course content at a small urban Chicago high school. Then I became a teacher leader at this same school and I felt myself started to shift my language. I felt as though I was interacting with students AND staff. Instead of just disseminating content I was engaging in leadership that involved more facets of education that centered around students rather than just centering on students. Subtly I began to sometimes call myself an educator. Then I moved to Michigan. When I moved to Michigan I started developing and then moving into a full-blown hybrid teacher leadership role. My role includes instruction 2x per week, curriculum coordination, mentoring teachers, engaging in home visits and student contact. I started referring to myself as an educator and the title to me has stuck. I feel as though educator encompasses more of the roles and responsibilities that I have to do and is more flexible surrounding my teacher leadership role. Teacher is only ONE of the roles I do as an educator. What about you? What do you call yourself? As I conclude my journey through Maker education as delivered through Michigan State’s CEP 811 course I felt challenged and inspired by the work that I have done the last couple of months. In order to share this journey with you I sought out another tech tool as a bit of a challenge to myself. I could have brushed off the old Prezi, but I was looking for something different I hadn’t used before. My sister told me to try Biteslide.com so I gave it a whirl. It was a little more elementary than I was looking for, but it gave me a fresh spin on the ideas I wanted to share. Let me know what you think of it as well as my reflections on CEP 811. When educators and parents talk about what makes children excited about learning, they always talk about these traits of creativity, ingenuity, and innovation. Even though schools are charged with developing and letting students explore their creativity, rarely do we discuss how we should assess these skills. Yet these are the skills that every educator and parent want their students to develop. As an educator charged with the assessment of student learning, I would assess creative problem solving during maker-inspired lessons by making slight changes to what I already do. Although creativity can be assessed, I do not think that the best way of assessing the work is through grades. Instead I would rather report and reflect accurately on what students know and are able to do. Right now the best system I have discovered for honest and accurate assessment/feedback is with standards-based grading and a standards based report card. My school works collaboratively using the systematic framework of Pearson’s Assessment Literacy project. First, we broke down all of the standards for any course we offer into series of learning targets (always refining!). Each learning target was identified as to having a purpose (knowledge, reasoning, performance, or skill). This is similar to the “standards map” that was created by Green Street Academy (Isselhardt, 2013, p. 1). We then added target-specific rubrics to the map. In doing so, the work reflected Grant Wiggins who said, “we can do and measure anything” (Wiggins, 2012, p. 1). When assessment is aligned to the target rather than the assignment, it indicates to the student that creativity is valued in this environment. Students do not have to be fixated with some of the notorious elements of rubrics such as “Neatness” or “Participation” or “Follows directions”. In addition, all of the projects are framed as suggested paths. Students then have the freedom to do and create to meet these targets.They also have unlimited options to revise their work or change forms, or even come up with a project of their own that demonstrates the targets – as long as they have a supervising educator. That means students literally can do anything they want to prove they have met the targets. It is freeing as an educator to assess this kind of creative work through the lens of learning targets. It means I do not have to look at 40 carbon copies of the same assignment and it also allows students to access multiple intelligences. This year as my school’s curriculum coordinator I have been leading the work with regards to rubrics and student feedback. As Wiggins stated without the “right criteria and multiple and varied exemplars” there is a danger that students will feel that rubrics will stifle criteria (Wiggins, 2012 p. 1) so I have been working with my fellow teachers on refining this process to make rubrics as clearly linked as possible to the learning targets. Even with all the merits to our program’s process and the advantages of standards-based grading and assessment literacy, there are drawbacks to this system as well. As Isselhardt points out, how to best prepare your students when they have difficulty working cooperatively is always a challenge (Isselhardt, 2013 p. 1). The at-risk population I work with have a lifetime of distrust built up from negative interactions with students and peers. It can be tough to break down those barriers. However, I harken back to the thoughts of James Paul Gee in his book The Anti-Education Era where he asks if human minds potentially need “to integrate with tools and other people’s minds to make a mind of minds?” (Gee, 2013 p. 2473). How to better assess the skills of collaboration is the next phase in the assessment process I want to embark on. The next phase that we are aiming to codify through assessment are students’ social-emotional skills We want to grow students’ competencies in areas such as communication, teamwork, problem-solving (Gee, 2013 Loc: 2730) and next year I am helping to lead the work on developing a learner profile, projects, and assessment framework. The end result is I hope to lead more groundbreaking work into how to assess the WHOLE student – I think it would make Grant Wiggins proud! Gee, James. (2013). The anti-education era: Creating smarter students through digital learning. Palgrave Macmillan. It may sound trite, it may sound cliche, but the best way I can explain the passion and curiosity I bring to my work as an educator as well as the technologies I use is with the opening project I remixed for the blended learning program I helped create – The Curiosity Project. . By walking you through some of the highlights of this project, I hope to show you how I am re-imagining education and what I am passionate and curious about in education, schools, and students. Each highlight corresponds to a # on the screenshot I took of the project. 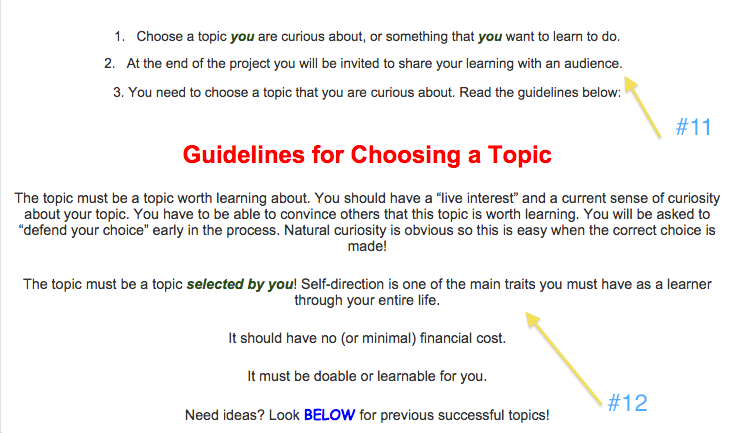 #1 – The title of this project reads “Curiosity Project”. It is the first project that every student has to do when they enter our program. It is a full-length, in-depth research project of the likes that many students haven’t ever seen or if they have gave up during the formal process. When I started to design curriculum for our new fledgling program I knew that I wanted students to do an actual formal independent research project, but this project is designed for students to conduct research on a project that they are curious and passionate about. First, because I knew that research and all the associated knowledge and skills with research are crucial for success in a blended personalized learning environment. Second because it starts the promotion of the idea that Thomas L. Friedman shares in his article “It’s the P.Q. and C.Q. as much as the I.Q.”, which is that students need to practice how to be lifelong learners. The at-risk students I worked with think, before they start this project, that school is completely divorced from their reality. They ARE passionate about learning, but they are NOT passionate about school. They see these as two completely separate spheres and I remixed this project to unite them both. #2 – I opened the project with two quotations to show students that I understand where they are coming from. The first quote says, “The cure for boredom is curiosity. There is no cure for curiosity.” The second quote says, “It is a miracle that curiosity survives formal education”. I wanted students to see that the learning process I was setting them up for. They should see from these that this isn’t a traditional school, nor is this a traditional assignment. #3 – This information is from the original Curiosity Project which is an open-source Google Doc that was created for elementary students overseas. This highlight shows three technology resources that I have liberal use of in my position as curriculum coordinator. First, open-source materials. I think a strong message I have learned in my CEP classes is that remixing materials is a part of the new Maker environment. I am curious at how to remix materials, knowledge, and processes for students to personalize their education and demonstrate what they know and how they know it. I found this elementary open-source project on the internet and knew I could remix it to suit the purposes for my students. Second, Google Docs. Google Apps for Education have been a godsend to how we have developed our blended learning program. No longer do our students have to rely on one computer to access the proper word processing or project tools so that various instructors can review their work. They don’t have to carry around flash drives or CDs, instead they have a cloud they can use to access their materials. Third, the LMS that this project is contained on. I looked for a learning management system (LMS) that would give us the ability to assess the learning targets our students were demonstrating progress towards and allow them to submit work to multiple subjects for the same project. The LMS I recommended to my program director was the Haiku LMS and that was ultimately the one we chose and displays all of our projects. 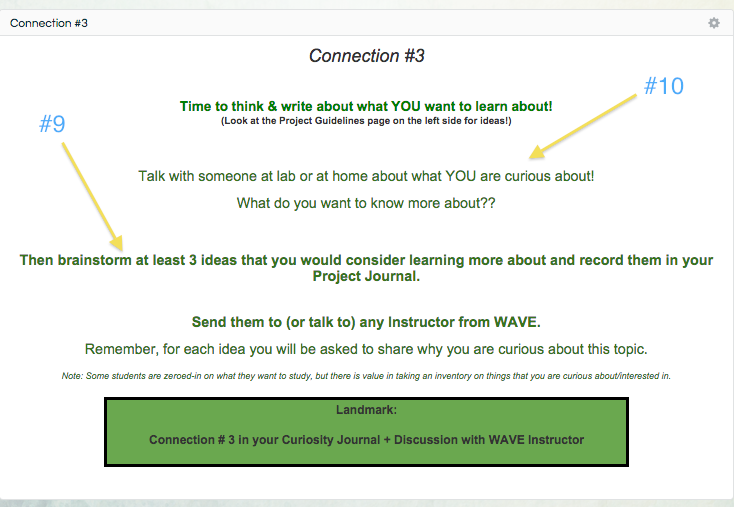 #4 – This highlight displays the skills students will learn and experience by being active curious learners. I included this list, because it is also my list. It shows how and why I make the choices I do as a teacher leader. It also shows the process I use to make curricular decisions for the students in our program. It makes my thinking visible. 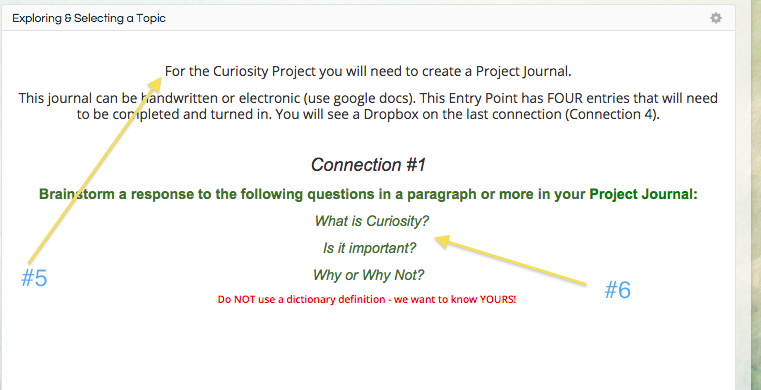 #5 – I wanted to show that students are asked to create a project journal. This journal can be handwritten or using an edtech tool. No student has to reflect using the same tool and that is my opinion regarding edtech tools. I am passionate about the creative use of technology in education, but our world is becoming more personalized along with schooling. People are choosing what works best for them and as Friedman wrote the tools you use “are being made obsolete faster”. I am constantly on a quest to expand my knowledge of edtech and how it can be used for my students & staff learning. #6 – These types of reflective questions are typical of the questions I ask students to ponder throughout their Curiosity Project. I wanted them to really think about the definition of the term “curiosity” and why it is important. This is the initial start to the project so I didn’t want to throw a bunch of questions at them. It is the same way I approach delivering professional development and training to my staff. I start with asking them to reflect and think for themselves first, before applying their knowledge to a greater context. 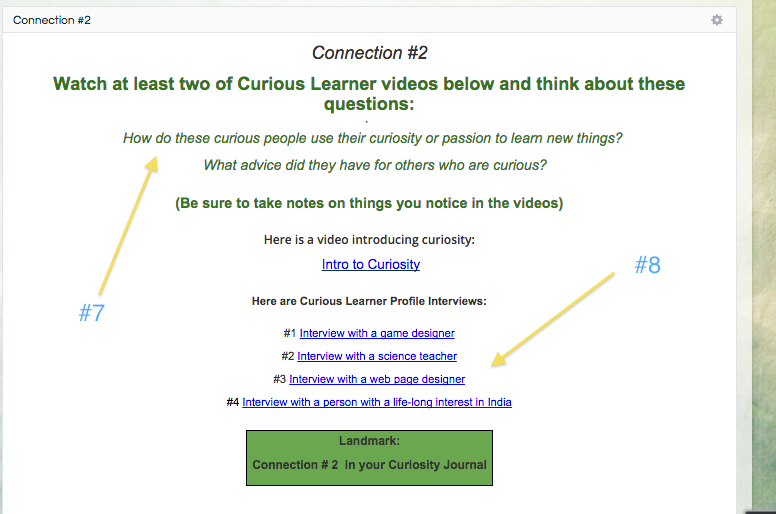 #7&#8 – In these highlights of the Curiosity Project, I asked students to look at others and study how curiosity and passion is used to learn new things. This is akin to Friedman’s charge that in the evolving world, we need to develop more “individual initiative”. That is how and why I have led the charge for the program development that I did. I was passionate that there needed to be better options for learners and I am constantly searching the globe through a plethora of helpful social media tech tools. There are too many to list, but just some that I consult regularly are blogs, Twitter, Facebook, Yammer, Google +, etc.) In this particular instance for students I am asking to use Youtube to share in the knowledge of curious learners reflecting on their journeys to develop and explore their passions. #9 – This highlight shows the meat of this project unfolding. Hopefully you could tell from the other highlights that this project is designed to have students study what people do with curiosity and what it means to them. Now they move into designing a curiosity project considering what they are passionate about. This is similar to how I have developed my passions. I helped design my current role in my program and I continue to share about my passion for hybrid leadership roles for educators anywhere I can. #10 – I am also equally passionate about the role of teacher leadership and how educators can connect with students. An important piece of this project is how much interaction it asks students to do with an advisor (a certified teacher). They have to have a discussion with an adult about their curiosities and passions and use that conversation to help them choose a topic they can develop. The technologies they have for communication are anywhere from Voxer to Twitter to Facebook or any Google tools if they are not face-to-face with that person. The sky is literally the limit! Since I introduced this project I have had students do topics as diverse as the history of rock ‘n roll, why mosquitoes bite, the effects of giant squid attacks, etc. 10b. After students select their topic they spend time pondering what they are curious about and exploring their topic in-depth. 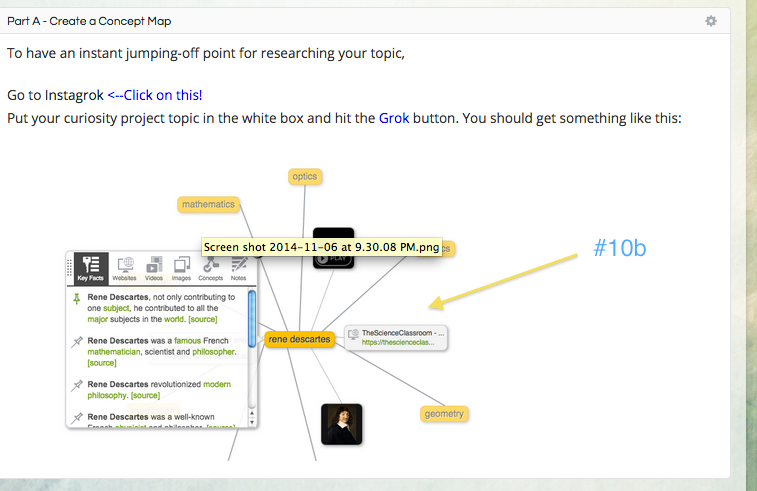 One of the ways I chose to have them do this was by using the concept maps from Instagrok. This web 2.0 tool creates words and concepts related to a keyword(s) students type in. I used to use other tools until I saw this one presented at a tech conference. Continually revising, changing, and exploring tech tools is another facet of my educational thought leadership. I am constantly seeking out new ways to improve student understanding and engagement and I do not hesitate to fail. Luckily I work with a collaborative team environment where failure and innovation are encouraged as they both benefit each other. The last highlighted items #11 & #12 both show other elements of curiosity, passion, and leadership that I demonstrate. First, #11 is showing that in this project students will be self-directing their learning, personalizing how they acquire skills and knowledge of research and then sharing that work with an audience. This is exactly what I try to do with my development – show my journey and share that journey. Finally #12 shows that self-direction is prized with this project and a trait of a learner. Because my job is innovative, hybrid, and does not rely on the “system” telling me when to work and stop, people have asked if we take advantage. In fact, the opposite is true, because we have trust and systems of collaboration put in place we all depend and connect with each other to impact student learning and the development of our program. We all created it and we all own it. That trait is what I created this project to help develop. It is lengthy, but it is about the curiosity and passions of students and they have made fantastic work! As Friedman argues, in the changing world we need intelligence, but we also need creativity and passion (Friedman, 2013, p.1). I hope that you see through the scope and sequence of this introductory pathway just how passionate and curious I am as both a learner and educator. I am always learning, searching, refining, and communicating in the hopes of creatively disrupting the traditional systems of schooling in the United States. I hope to continue to grow my leadership and create revolutionary systems of education using technology. The adventure has begun! My work regarding a wicked problem of practice from the New Media Consortium’s Horizon Report concluded this week with me addressing the issue of rethinking how we reward teachers. I have spent a lot of time thinking about why I feel rewarded and so incredibly satisfied in the public school job that I have. The recommendations I have put forth in this paper are, to some extent, some of the recommendations my current employer has put into place. I know that many school districts are struggling with compensating and rewarding their hardworking employees. Therefore, I wanted to think about this wicked problem NOT through the lens of merit pay or increased compensation, but through more creative rewards that used technology to address this wicked problem. First, I created an infographic of the wicked problem of rewarding teachers. Next I put forth my recommendations for new ways to reward teachers in this white paper: Not Always About Money: How to rethink rewards for educators in the 21st century. Please take a look at both of these and give me feedback. I look forward to hearing other people’s thoughts on this important topic! Reward. Geralt. (2013). [Image file]. Retrieved from pixabay.com. I have always embraced reading and a healthy “infodiet” since I was a child. When I read the second half of James Paul Gee’s The Anti-Education Era: I thought about the affinity spaces I use to inform my thinking around topics related to education. Gee defines affinity spaces as, “ “An affinity space is a place or set of places where people affiliate with others based primarily on shared activities, interests, and goals, not shared race, class culture, ethnicity, or gender” (Gee, 2004 Loc: 67). Some affinity spaces that feed my professional “infodiet” are the Teach to Lead educator community, Twitter, and blogging. The Teach to Lead community informs my thinking with access to a national educator community focused on teacher leadership. 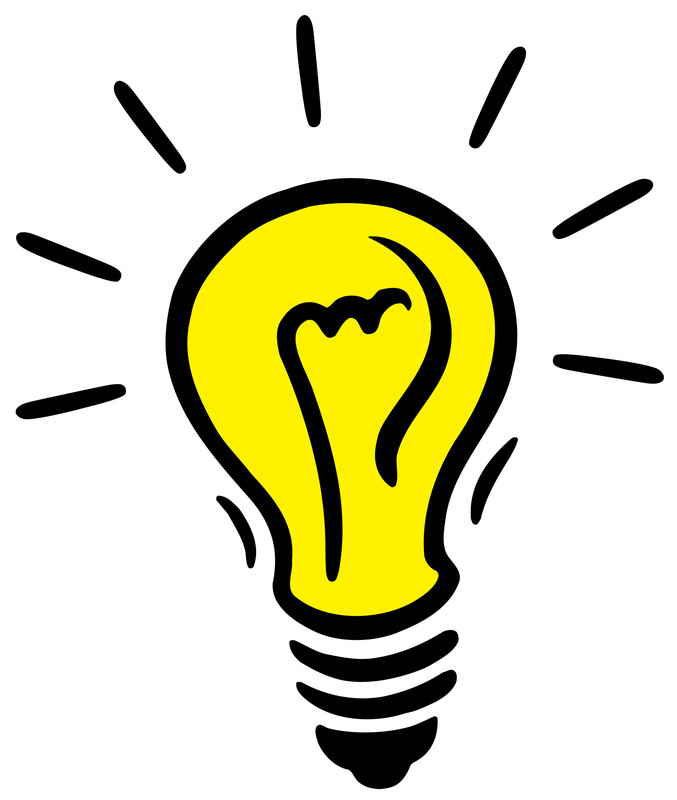 Twitter & blogging have given me a way to discover educator voices and new ideas and practices. I committed myself to a goal of one chat per week and found I share and collaborate through this affinity space just as much as the colleagues I see almost every day face to face. Blogging too has given me an affinity space where I can engage professionally in longer musings and reflections on my learning. Reflecting on the second half of Gee’s book, I thought about the limitations in my “infodiet” that used to occur before this year. Before this year, I primarily used the community and spaces set up by others to inform my thinking on professional topics. For example, I used Google Groups, chats, and professional developments set up by my job, organizations, and professional communities I belong to. I didn’t need to seek them out, because those networks were set up and I was being slotted right in. But there is a danger in just being satisfied rather than seeking out. This year I have focused on the latter, but I pushed myself even further this week to test the reach of my new “diet”. When I added three new sources of information to my infodiet this week I searched for new sources based on Gee’s statement, “We seek the best answers we can, act on them as our ‘best bets’, and stay open to revising them and learning more” (Gee, 2004 Loc: 2454). The first source of information was a selection of comments on an article discussing the current MI teacher evaluation legislative bills. In reading these comments, particularly the ones I disagreed with, I realized the comments on these articles reflect a part of what Gee says society should be like. These comments are a way in “which everyone feels that they count” (Gee, 2004, Loc: 2490). People are making comments because they want to feel actions like commenting “can have a meaningful impact on others for the good.” (Gee, 2004, Loc: 2490). The comments in opposition said without hyperbole or vitriol let me know what informed citizens would say, not just the opinions of those already in my circle. The second new source I added were entries of a homeschooling blog posted by a high school acquaintance on Facebook. I found the school space I operate has much in common with the aims of homeschooling. Sharing feedback allowed both of us to develop and expand our mindsets a in a public forum. Finally, I followed a public policy group I generally tend to disagree with on Twitter (Mackinac Center). Their policy positions reflect their visions and values. But I have shared interest in education and through understanding their position I can leverage their expertise even if I disagree with it. Incorporating these different sources are already pushing my thinking and changing my worldview. Here’s to consumption of my new “diet”! This week my task was to redesign my learning space to better optimize student learning and incorporate the pedagogy of modern education design and learning. First, an introduction to my current space. I am fortunate to work in a space with some design elements of 21st century learning. My school’s hybrid learning workspace (heretofore referred to as the “lab”) does not reflect the usual classroom setup. In the main lab (which is the size of 2-3 traditional classrooms), instead of rows of desks there is an L-shaped arrangement of computers, two flanking low bookshelves, and several modular tables that can be rearranged along with a whiteboard and materials cabinet. This type of learning environment reflects the advantages of collaborative learning and connectivity (Thompson, 2014 p. 21) however, there are missed opportunities for building an even better learning environment. I used SketchUp Make to image a reinvention of this blended learning space. The first change is with the walls & lighting. Currently in our lab, all of the wall space is completely blank and there are just overhead fluorescent lights. The biggest change in my redesign is to add paint, the Alliance for Excellent Education relates “Classroom colors should be warm and calming; not overstimulating and distracting.” Right now our walls are sterile and generic white. The 2013 Barrett, Zhang, Moffat & Kobbacy study also shared that color and light (among other factors) had a statistically significant effect on student performance. I added a few lamps to add softer light since there is no way to add more natural light into the space. According to the ideas of The Third Teacher, learning spaces should also display student learning, both past and present in order to track progress. Right now the accomplishments are only celebrated in our virtual environment – viewed only by that student and no one else. My redesign adds these display opportunities. The second change is with the tables and workspace. Instead of just using bland modular tables with sterile student chairs, I want to incorporate a combination of workspaces including whiteboard tables, higher tables with stools, and comfy chairs. As Michael Posner writes, “Simply put, the brain likes novelty, new things” (Persaud, 2014 p. 1). Some of these tables are converted to whiteboard tables for increased collaboration. Having convertible seating and workspace will allow for students to arrange the workspace for their needs much like their personalized learning in our school. Echoes teacher and design consultant (as well Michigan Ed Voices fellow alongside me) Erin Klein, “flexible seating arrangements…allow for easy transitions will serve students today and in the future” (Thompson, 2014 p. 19). The third change is with an essential part of our learning environment – our computers. Instead of utilizing desktops, my new design has bookshelves filled with different tech devices. Again, having portable tech tools would allow for greater personalization of the space. Plus the choices in tech tools and seating involve student decisions in the classroom’s functionality too. For each change I need resources necessary to carry out my vision. First, with regards to painting & lighting, the cost would be thousands of dollars (particularly for the paint), but the cost would come down considerably if we organized the staff and student volunteers to do it all ourselves. I looked up whiteboard paint and a set of DIY instructions for how I could transform some of our modular tables into them. The paint is approximately $275/gallon. The new tech tools would not necessarily be purchased all at once, but phased in over time as devices age out. Currently we are needing to purchasing laptops or Chromebooks, after so getting different tech devices would line up with our existing technology budget. I just requested a new Chromebook through a grant that was approximately $300 dollars and we would need around 30-50 to fully supply our lab space which could approximately $9000. The classrooms of the future are exciting, collaborative, and engaging places to learn from. I am excited to see if my school can continue to make good decisions to get to better space and design choices for student learning. Before I could examine the wicked problem I chose in CEP 812 about rewarding teachers, I needed to assess the population of teachers I was working with as well as their levels of expertise and needs around technology. Knowing this information will help me direct my inquiry into how technology could be used to facilitate rewards for educators. Clicking HERE will contain a link to the survey I gave my staff as well as an analysis of the data they provided.